With a new Sony smartphone comes a new Sony ad campaign, and the Z3's has just been released in the form of (so far) eight videos published on the company's Xperia YouTube channel. While seven of the spots are actually one and the same product storyline edited differently to showcase various features, one of the ads really did strike me as genuinely good, which is pasted below. It's 3 minutes or so long, so it's a bit of a lengthy video as an ad, but I think Sony really nails the "product as hero" thing here with just the right mix of emotion (eg, not going overboard) and real human interest story. Sure, other phones can play back hi-res audio, but Sony's street cred in the hi-fi and recording world put this ad, I'd say, right on the money for the sort of brand message Sony should be sending for Xperia. I don't see a lot of good smartphone commercials - this is a good one. The rest of the ads focus on a young, fun-having amateur videographer who lives the Sony Lifestyle(TM) with his various Sony products in typical Sony fashion: using all of them, all the time, for everything. The fact that all of the videos feature the same soundtrack makes them a bit annoying to watch in sequence, so the one pasted below is a basic collage of everything in all the other videos. I've not actually heard that cover of Nightcall before - so that was an enjoyable part of the ad. 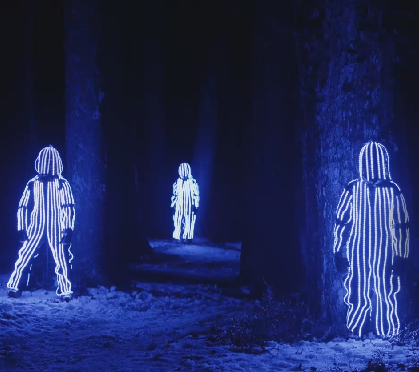 Otherwise, we see our hero make the rather dubious decision of placing his phone LITERALLY IN A LAKE WHAT ARE YOU DOING MAN, which then inspires him to create a bunch of LED suits for people to wear while snowboarding at night I'm not really sure why though? Seriously, it's a bit confusing as lifestyle ads go, but I guess Sony's trying to say its products understand artists, or something. Still, the ad stays on point in one key way: pretty pictures. Sony's always had an impressive visual style in its ads, and this one is still entertaining to watch in that respect, even if the actual plot is a bit (okay, totally) ridiculous. The only part I really take issue with is that while they do get all of this great video of the LED snowboarders coming down the mountain, you know none of it was actually captured with the phone, despite the fact that they're pushing the whole camera thing as a big part of the ad. If you want to see the rest of the videos, just head to Sony's Xperia YouTube channel below.